The Aprilaire 1830 - 70 Pints Per Day with Automatic Digital Control Dehumidifier. This product is a brand new genuine Aprilaire dehumidifier. The Aprilaire 1830 dehumidifier uses environmentally-friendly R-410A refrigerant and will remove up to 70 pints of moisture per day from your home's air, which makes you more comfortable, and since dehumidified air feels cooler than humid air, your thermostat can be set to a lower temperature - and that means lower utility bills. This model replaces the Aprilaire 1730A. 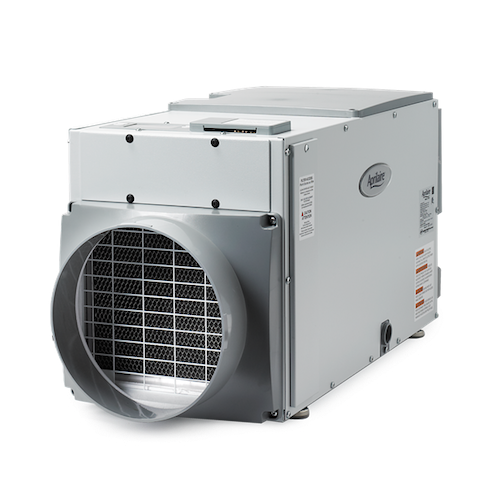 The Aluminum coil makes the Aprilaire 1830 more corrosion resistant than most other dehumidifiers available, and has top or end discharge with 10" round duct. A MERV 8 washable filter is included with this dehumidifier. This whole-house dehumidifier removes 50% more water per kilowatt hour than other leading whole house dehumidifiers and features an automatic control. >If you have any questions regarding this product please feel free to email Sales@DiscountFurnaceFilter.com or call 1-888-623-4678 and our friendly Customer Experience Representatives will be more than happy to help.